We returned from Mumbai to the 40c heat of Delhi for the final couple of days of the Commons & Lords RFC tour, and we were straight back to late nights and early morning starts. Monday morning we had an early breakfast to leave at 8am for the Katha School which is sponsored by BT. 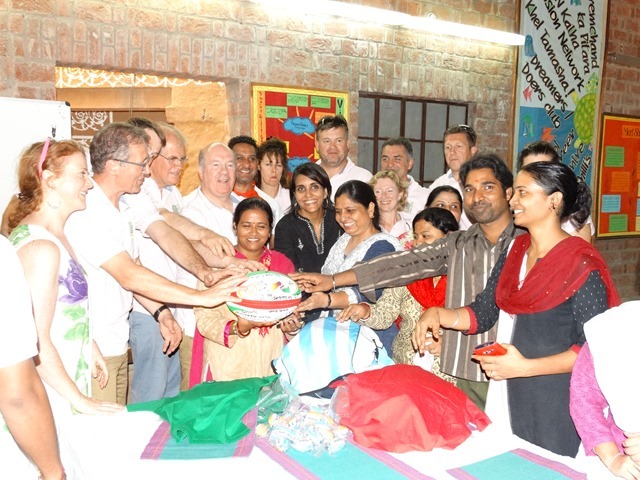 The school is in the Delhi slums and caters for infants through to young adults and it aims to equip their students with skills that will get them jobs in modern India as well as in more traditional occupations. We were shown around classes teaching such diverse subjects as baking, sewing, business studies, computing and robotics. The younger age groups were playing, drawing, learning to read and write but all were fascinated by the group of Europeans wandering around the school. We saw from pictures on the wall that we weren’t the first as Prince Charles and Camilla had visited a couple of years previously. We split into three groups; one taking a rugby session, another a Q&A session and a third spending more time with classes. I looked around the computer room where the students were learning the standard Microsoft Office packages, but the real value of this education was clear from the success stories of alumni that had gone on to get decent paid administrative work allowing them to support themselves and their families. After some refreshments, including freshly baked biscuits made at the school, and some presentations of t-shirts, rugby balls and stationery, we walked back to the coach a quarter mile away and to what was supposed to be a tour around New and Old Delhi followed by an hour of shopping for souvenirs. It is fair to say that this was the low point of the tour. I’m not sure what went wrong in terms of communications, but after spending 15 minutes at the India Gate, a memorial reminiscent of the Arc de Triomphe in Paris, we drove around aimlessly for three hours or more not seeing anything of note or stopping anywhere until we were dropped off at our hotel with instructions to be changed into No 1s and ready to be picked up again in 90 minutes to be taken to a reception at the British High Commission. So, with white linen suits, pink shirts and blue spotted ties and ladies in their posh frocks, we got back on the coach to battle for two more hours through the Delhi rush hour traffic until we reached the beautiful colonial building that was the residence of the High Commissioner. The reception was being hosted by a British trade delegation led by Deputy Prime Minister Nick Clegg with at least 700 guests so there were plenty of opportunities for networking and finding out more about life and business in India. The reception was outdoors but it was the first garden party I had been to where fans had been placed outside to keep guests cool. It was stiflingly hot with temperatures staying in the high thirties despite night having fallen. For every alcoholic drink I consumed I had two glasses of water or fruit juice to try to replace the fluid I had lost through sweating. An hour into the function most of the tourists were gathered around the fans and when it was time to leave at 10pm we were grateful to get into the air-conditioned atmosphere of the coach. It took us an hour to get back after which I calculated that between 8am and 11pm, we had spent a total of eight hours on the coach, and perhaps it was no surprise than a number of as had noticeably swollen ankles the next morning. Tuesday was another very early start to catch an 8am flight to Jaipur for a day trip. Having experienced such a frustrating day on Monday, this was definitely one of the highlights of the tour. Jaipur is known as The Pink City for reasons that are obvious when you see any pictures of it. 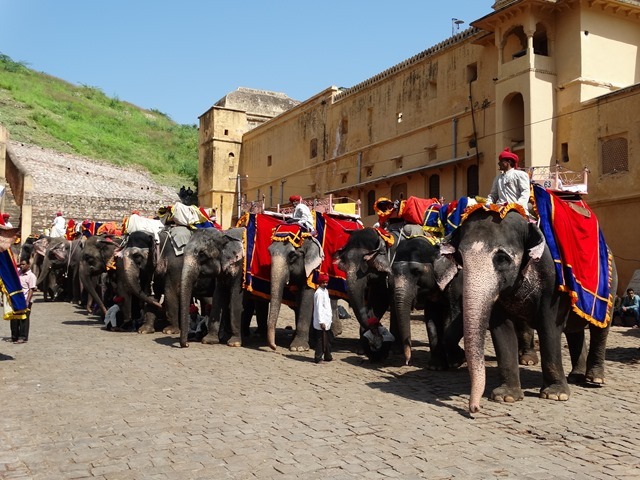 But the former Indian capital has a rich history that we explored at the Amber Fort having done the tourist thing of taking an elephant ride to reach it. An excursion to see some of the remarkable buildings in Jaipur, and lunch at a restaurant, was followed by two hours in one of the markets where we could finally buy souvenirs and a lot more besides. I was struck by the number of animals that wandered around the city; monkeys, horses, goats, donkeys and of course, cows. A 7pm flight got us back to our hotel in time for a 10pm dinner at our hotel before the tour court, details of which by convention remain with those who took part. On our final day there was one more duty to perform, a visit to a school on the way to the airport. This meant once again getting up very early, packing our bags, checking out and trying to grab some breakfast in time to get on the coach by 8am. As usual traffic delayed us both before and after the visit so we arrived at the airport just over an hour before our flight, but we all managed to get on board on time. So as I sit in my aircraft seat for the nine hour journey, I have some time to reflect on a tour to think about what we had achieved. All the tourists had paid for their own flights, transport and accommodation, but as this was a Commons & Lords rugby tour their were certain obligations to represent the British parliament and behave in an appropriate manner. At all of the visits to schools and charity projects we were very warmly received and I hope we reciprocated by engaging with them. In terms of Rugby we won one and lost one, a better tour record for the club than any achieved in recent years. Playing Delhi Hurricanes and the President’s XV in Mumbai raised the profile of the game in the cities, with the games, as well as the visits, being widely reported in regional and national newspapers. 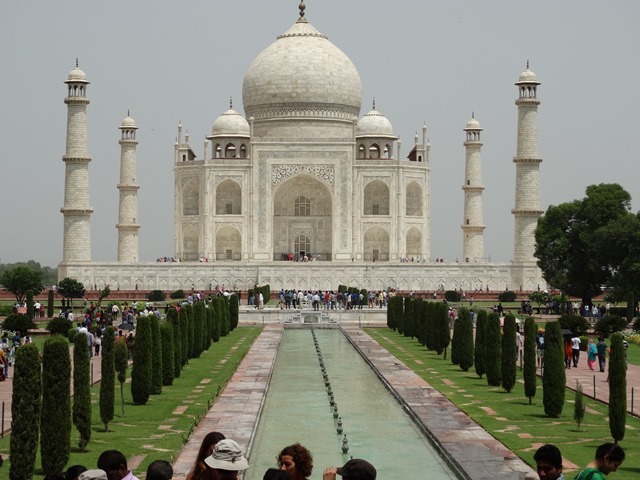 Culturally, I felt privileged to have seen the Taj Mahal at first hand, enlightened to visit Jaipur and delighted to have spent time in Mumbai, a city I would love to see again given the chance. Additionally, a boyhood dream was realised when we played at Bombay Gymkhana, although my enthusiasm was tempered by the knowledge that this is very much a club for the elite, excluding all but a tiny number of the city’s 21 million population. A disappointment was that our hectic schedule stopped us from seeing more of Delhi, my memories of which are mainly centred around being stuck in almost constant traffic. A huge thank you to Alex Murphy and his team for organising the tour, to Delhi Hurricanes and Bombay Gymkhana for demonstrating that Rugby’s Core Values are present wherever the game is played, and to all the people that were so welcoming at the visits, functions and events we attended.